Register TODAY! 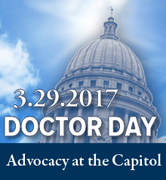 Join with physicians across all specialties from all over Wisconsin, and converge on the Capitol in Madison at Doctor Day 2017! Physicians and medical students from across the state will participate in a briefing to learn about key issues, and will then meet in small groups with legislators and their staff.